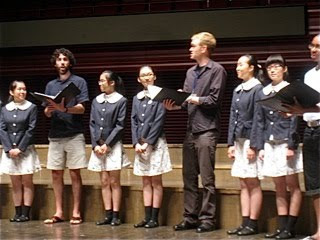 We were thrilled, with the help of Chinese friends, to be able to do a full-length concert in China, as well as the San Francisco Week events in Shanghai. 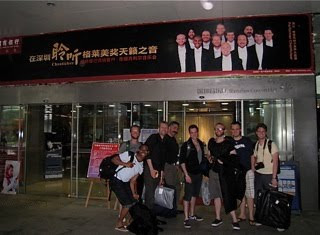 We were here in Shenzen last May on our debut tour, and loved the hall, and the Cantonese food and the tropical climate - even more so this year. Even after the post-concert dinner, the temperature didn't seem to have declined from the 88F announced when we arrived. 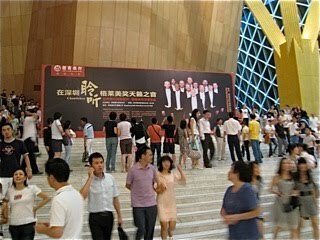 The concert was sponsored by China Merchants Bank as a gift to their customers who almost filled the hall and were a curious and warm audience. 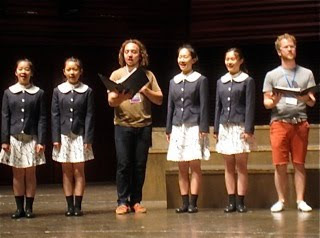 Michelle Hu, Director of the Lily Children's Chorus - a very well known group in Shenzen- had contacted us in advance through a friend to propose that the children ( actually young women) might sing Molihua with us as a surprise encore. They not only agreed to sing it the way we do, but added some wonderful touches of their own, including movement. Not having seen them until warmup at 6pm, we had no idea how really fine they are. It was a real pleasure singing through the song a few times together - we wish we had had longer with them. They then waited backstage through the concert. We've done a few notable collaborations this year - this will be a memorable one! 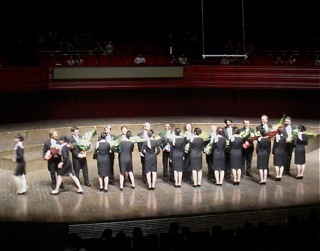 The audience seemed pleased, and, as last year when we were in this hall for the first time, we were given absolutely magnificent bouquets - no two alike. 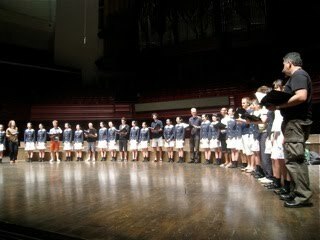 We finished our concert and left the stage. When we came back the girls came with us and we sang Molihua together. The audience absolutely loved it, and so did we! 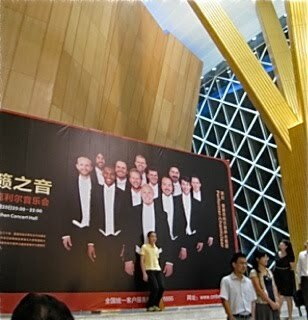 Lots of audience members stopped after the concert to contemplate the Mt. Rushmore-like frieze of us in the lobby. Kids could have their pictures taken with the evening's entertainers! Backstage after the show, the Lily Children's Chorus sang us three numbers before they left. They are terrific! 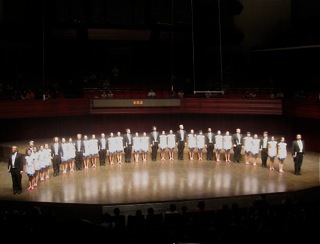 We congratulate their Director Michelle Hu for her very fine work, and thank her for having the idea to join our concert. The participation of the girls really made it an evening to remember. 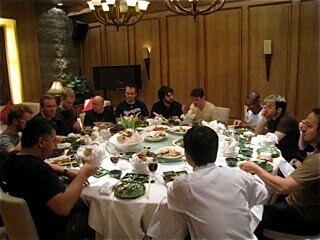 A delicious Cantonese dinner offered by the sponsors topped off the evening which was the last performance of this quick dash to China and back, and the last performance of the season before we go on vacation. 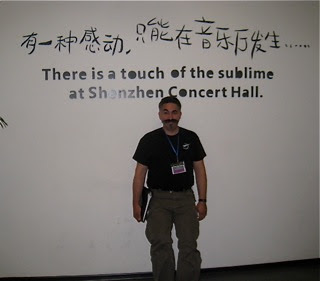 Tomorrow - back to Shanghai, meetings with tailors, attempts to see some of Expo, then home on Tuesday. While it was a very quick trip here, we were happy to be back, and will be thrilled to be invited again. Thanks again to the San Francisco Shanghai Sister City Committee for including us, and all the people who helped us while we were here.